Can you believe all of this drama surrounding Project Jigsaw and the Java modularity debate? I was so thankful yesterday when President Donald Trump fired the director of the FBI, drowning out all of the Java Jigsaw finger pointing tweets and usurping them with delightful, 140-character opinion pieces on American politics. Voting on JSR-376, the Java Platform Module System (JPMS), thirteen JCP members voted ‘no,’ while 10 voted ‘yes.’ Unlike US elections, the Java Community Process (JCP) does not employ an ‘electoral college’ system, so votes are won or lost using an archaic ‘majority wins’ type of system. 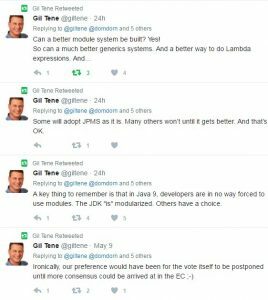 JPMS Java modularity JSR-376 is voted down. Part of the Project Jigsaw melodrama came from the fact that both IBM and Red Hat had announced before the JCP vote on Java modularity that they were not going to support JPMS, which is bit of a break from traditional decorum. JCP members don’t typically announce their intentions before a vote happens. Having said that, very few JCP projects are as contentious as Java’s Jigsaw. “There is still work required to bring the community closer to an agreement on the proposed standard,” said IBM’s Tim Ellision in an April 28th, community email reply to Mark Reinhold, the JCP lead and the highly respected Chief Architect of the Java Platform Group at Oracle. 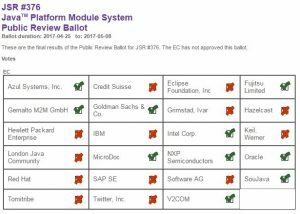 “IBM is also voting ‘no’ which reflects our position that the JSR is not ready at this time to move beyond the Public Review stage and proceed to Proposed Final Draft.” The word ‘also’ in Ellision’s quote refers to Red Hat’s prior announcement that they were not satisfied with the way the Java modularity puzzle was coming together. Seldom spoken in these public discussions is that there are often very private motives behind the JCP wranglings of the big players. Red Hat has their own, open source modularity project which they use in their Wildfly server. JBoss modules has always competed with Jigsaw. IBM’s WebSphere has always had a long history of supporting OSGi. Who knows how these private interests compete with a company’s public ones. Falling into the ‘no good deed goes unpunished’ category, many of the JCP committee members who voted in favor of Java modularity found themselves in the unusual position of having to defend the fact that they wanted to move Project Jigsaw forward. Azul’s CTO Gil Tene took to Twitter to defend his company’s ‘yes’ vote. “Can a better module system be built? Yes. So can a much better generics systems. And a better way to do Lambda expressions. And…(sic),” tweeted Tene. “Some will adopt JPMS as it is. Many others won’t until it gets better. And that’s OK.” Personally, I’m kicking myself a little bit because I had Tene on the phone a few weeks ago talking about the Azul’s Falcon LLVM compiler, and I should have asked him more about the JCP vote. We did speak about project Jigsaw, but it was more in terms of JVM performance and improved startup times, as opposed to the upcoming vote. A number of years ago, way back in 2011 to be exact, Peter Kriens was OSGi’s Technical Director, and he penned a few interesting articles about implementing modular systems in Java, many of which sparked intense debate in the TSS forums. We spoke a few times about Project Jigsaw, and while our conversations took place far too far back in the past for me to quote him accurately on anything, the impression he always gave me was that tackling the classloader issue in Java was an incredibly complicated task, that people who try to implement modularity in Java will run into far more unanticipated complications than they could ever have imagined, and that the purveyors of Project Jigsaw were just a little bit naive about how easy or hard it would be to build a system of modularity right inside the JDK. Six years later, it would appear that many of Kriens’ consternations have been borne out. Classloaders are a mess in Java. Their existence is understandable given the evolution of the JDK, but what was fine back in 1996 is a bit of an embarrassment as we do software development in 2017. I’ve got complete faith in a guy like Mark Reinhold to get the Java Platform Module System back on track. Hopefully that will happen sooner rather than later.